Dumneazu: From Katz's Deli to Williamsburg: Let My People Go! From Katz's Deli to Williamsburg: Let My People Go! My son, Aron, has as much an interest in the culture of food as I do... and since he is a little Hungarian with an ethnic New York background, he has been sampling the best of what New York's neighborhoods have to offer as we tromp around. Usually, when he has visited with his Mom or is in the city with relatives from my family, they travel the regular Manhatten visitor routines. I like to take him off the map into the ethnic neighborhoods where the food is cheap, unpronouncable and often fried. On Monday we took Aron and his cousin Max to the Lower East Side of Manhatten and to Brooklyn on the Jewish Heritage Foods Trek. First off... Katz's Deli. This was Aron's second trip this month... I have written about Katz's Deli at length on earlier trips, so suffice to say that Katz's pastrami and corned beef is like deli meat crack, once you have it you you can not erase its presence from your mind for years afterwords, and you will do all in your power to get more at any cost. I actually learned to corn my own beef in Budapest, and although it ain't Katz's, it helps me through the months and years when I can't get the cold cuts of my misspent youth. Damn you Katz's... damn you to hell! I will explore the Amazing World of Katz's Deli later during my stay in New York, so rather than linger... we walked a bit around the neighborhood. Just down the street is Yonah Shimmel's Knish Bakery. This old Romanian Jewish bakery makes the potato lump known as knish - but the things they sell today as knish, I don't know... sort of some new age healthy Israeli influenced knish that is unfamiliar to those of us who were raised on the old square, yellow skinned potato knish. I will return in the future to the discussion of knish... I get so angry about people changing knish that I simply lose my train of thought and start throwing things... The the old Lower East side of Manhatten. This was the nabe where all the Jewish immigrants would first settle on arrival in America one hundred years ago. The old First Romanian Synagogue on Rivington Street was one of the most enduring monunents to this era, but after its roof fell in a few years ago it was condemned as irreparable and torn down. All that remains is the entrance to the old Beis Midrash (torah school.) the area still has a small Jewish presence, but since the 1970s the Lower East Side had morphed into a Latin American neighborhood (adopting the Spanish pronounciation of the area's name: Loisaida) a Chinese neighborhood, and now it is one of the last hip zones in an increasingly expensive and un-hip Yuppie Manhatten. But the areas east of Avenue A and Ludlow St. are home to lots of Mexicans (always a vast improvement factor on any New York neighborhood... honest hardworking people... send us more!) and cool bars, though. Next stop: Williamsburg, Brooklyn. South Williamsburg, in fact. While the North part of this neighborhood has become famous as the "hipster" center of new York (inhabitied mostly by folks not born in NY, in fact) the southern side (around Lee Avenue, Befored Aveneue, Division Street) is still home to one of the strongest, most insular Hasidic Jewish groups in the world: The Satmar Hasidim. Originally from Szatmar and eastern Hungary, this is a neighborhood my son and nephew had only heard about - a lot of Jews don't ever visit here, scared off by the otherworldly sight of thousands of devout Yidn in payes and kapote going about their business with utter disregard for the secular universe around them. I have a lot of respect for the Satmars. They are oblivious to the outside world's opinion of them, and if you examine their inner society closely you can find an awful lot that modern New Yorkers reject and modern secular Jews find absolutly repulsive. Women's roles, for example: the married women shave their heads and wear wigs and local stores often post religious dress code restrictions (which, of course, would be accepted by anybody from within their community anyway.) But without these communities the Yiddish language and an old, rigid, and pious sense of Yiddishkeit in all its straight-jacketed cultural glory would have been lost after WWII and the Holocaust. In Brooklyn, thousands of children still dream in Yiddish every night. Just a few blocks north and you hit the "hipster" zone of Williamsburg. This used to be a run down cheap nighborhood until the rents attracted young students and artists from the ever more expensive regions of south Manhatten. Today it is a lively scene of bars, bistros, and shops, cleaned up, and yes, self consciously hip. Aron and his cousin Max had a stroll and marveled at the creative efforts of the local vegan movement and their detractors. Expect more soon on New York's pastrami parlors and Jewish neighborhoods, but Aron, alas, will be returning to Budapest this weekend, while I still have a month in New York - yes, I have a project to finish and then Fumie returns to NY from Tokyo at the end of January. From here on... my life gets suddenly very busy. 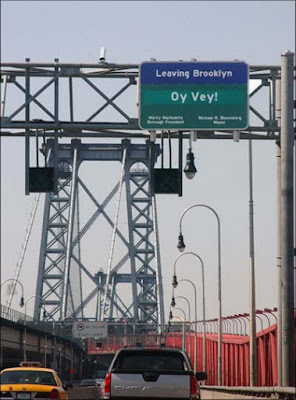 And you have to admit: Brooklyn does have a unique sense of humor... this is a sign on the outbound ramp of the Williamsburg Bridge as you exit towards Manhatten..
Christmas Eve in Jersey. With Jews. Like Us. Korean New Jersey: The Kimchi Belt.